If you are a Leftie, Then Left Handers Day is just for you! Left Handers, also commonly referred to as Southpaws, are the brunt of more than their share of jokes all year long. How do I know? Yup, you guessed it! It ain't easy being a leftie. But those of us who are, would have it no other way. Lefties are proud of it. In school, have you ever seen a left handed desk? They don't exist. Many left handed items cost more. Novelty coffee mugs are made with the picture or text for a right handed pick-up. Scissors for for right handers. Only a lefty would understand this. The computer mouse you are using as you read this is designed for right handers. Left Hander's certainly earned the right to have a day dedicated to them. And, August 13th is that day. So take a minute to appreciate your left handed friends and loved ones. Don't forget to send them a Left Handed Day Ecard to show your respect. Remember today and every day: "Lefties have rights!" As lefthanders, we never do anything right....kewl! While many people are left handed, very few are 100% left handed. For example, many Left handers golf and bat right handed. On the other hand, there is a high percentage of righties who are 100% right-handed. 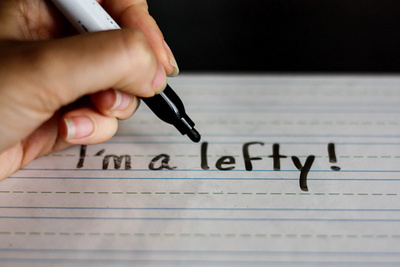 Lefties are also called "southpaws". The term was coined in baseball to describe a left handed pitcher. During the 1600's people, thought left handers were witches and warlocks. International Left Hander's Day was first celebrated on August 13, 1976. It was started by Lefthander's International. It is believed that all polar bears are left handed. There is a rumor that octopuses have but one right hand. Scientists are diligently studying this issue. Think about it: Everyone is a Left Hander in Left Hand, West Virginia. Left handed myself, all my life I had problems and despite the fact that nowadays there are left-handers shops even in Helsinki you cannot replace every household item or the front door of the building you live or in your working place. Not to mention that I was forced violently to write with my right hand in my childhood due to then prejudice to left handed people – and oddly this is still my only right-handed act. My usual answer if people want to understand how I feel is just tie your right hand in your back and try to survive like that for three hours, then you will get a taste on how my life is.